Cherry Limeade....Fantastic, it is a weekly necessity for me during happy hour. May I recommend the pineapple milkshake? I sometimes ask myself, where did Dave come from and how did you end up with him? And why is he still so fabulous to you after all these years, it must be love (or maybe he lives in fear of you) Miss you guys! 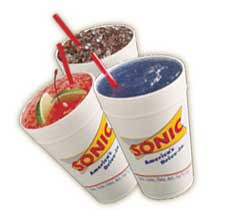 I can't believe T-town got a Sonic...it is my favorite. And Grace, we all fear Michelle! Although I do think Dave has mellowed her out over the years.